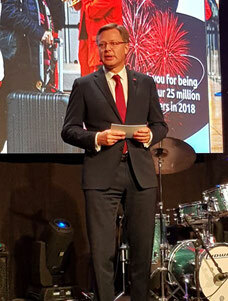 The federal elections to be held in Belgium this spring offer policy makers a unique opportunity for the creation of a stable legal framework supporting the further growth of Brussels Airport, said CEO Arnaud Feist at the Brussels Airport’s New Year’s reception. As for 2018, Mr Feist pointed out that Brussels Airport had recorded its highest volume of the last decade (732,000 tonnes, including trucking). Among the important expansion projects announced or initiated were the development of Brucargo West, a new animal inspection centre and a new facility for valuable cargo. Up and running is DHL Express’ new distribution centre, bringing great added value to Brussels Airport and already exceeding its capacity. Despite this, Brussels Airport is determined to stick to its 2017-2020 Strategic Plan. “We keep developing the airport”, said Mr Feist. In this respect he called on policy makers to finally create a legal framework (what Mr Feist particularly means is a stable noise regulation). The present federal government, operating under resignation since 9 December 2018, has made a sport out of postponing a decision in this respect since taking the oath on 11 October 2014. New elections are scheduled for 26 May 2019. “It’s now or never! A future solution is within reach”, said Mr Feist. ”It is time to make the right policy in which we can together create economic growth and jobs.” Mr Feist expressed the hope that specific elements of the new noise legislation would be included in any governmental agreement that follows the elections.